Sound "Clear, open, musical"; an involving and detailed "time machine" that "provides a superb musical experience"; "provided a wide and deep soundstage. If the record had it, then the Phono 1 reproduced it." Features Moving-magnet and moving-coil cartridge support -- and auto-adjustment for MC cartridges; outboard power supply; small size. Use Recommended 200-hour break-in period for both MM and MC circuits. Value "At $990, it is stunningly inexpensive for what it will do for your vinyl collection." Is there a heaven? Is there a hell? At one time, I would have said no to both these questions, but in the realm of the material world, I have now discovered that both exist right here on earth. Heaven is using the Audiomat Phono 1. Hell is being deprived of using the Audiomat Phono 1. It may sound flippant to use such serious religious terms to describe the effect of a small black box, but consider these facts. Most readers of and reviewers for SoundStage! maintain that listening to music can be a spiritual experience. Many of the same group have a dual interest: music and good reproduction of it. All of us, in some way or another, seek a kind of magic from our audio systems. Thus the role of the Audiomat Phono 1 in this world: It ensures that listening to music is a spiritual experience. It captures the emotion in music. It offers abundant detail and technological sophistication in the service of the divine in music. It also makes listening to vinyl the wonderful experience that everyone (who agrees with all of us throwbacks, that is) claims it to be. 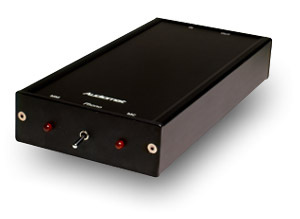 The Audiomat Phono 1 consists of two little black boxes. Some 20" downstream from the heavy-duty wall plug, the power supply feeds an additional 55 inches of power cord. This fits into a recessed IEC plug on the Phono 1 itself. The Phono 1 is petite -- 8 1/8"D x1"H x 3 7/8" W. At one end there is the power connection, a grounding terminal, and two pairs of RCA connectors, in and out. At the front of the unit is a toggle switch in the middle of the front plate and two red LEDs, one on each side of the toggle. Above the LEDs on the top plate are the letters "MM" and "MC," for high-output moving-magnet cartridges and low-output moving-coil cartridges respectively. The case of the power supply is the usual high-impact black plastic, while the Phono 1's case is metal. Audiomat advises that the input impedance of the Phono 1, set for a high-output cartridge (MM setting), is 47k ohms. For a low-output cartridge (MC setting), the Phono 1 auto-adapts, from 10 to 100 ohms. The unit's nominal sensitivity for the MM setting is 5mV and for the MC setting is 0.3mV. Its gain for the MM setting is 42dB, while it provides 66dB of gain in the MC setting. The Phono 1 encompasses a reported bandwidth of 20Hz-20kHz. However, Audiomat also expresses "serious caution about the measurement methods in general." Given the wide variety of amplifiers into which the Phono 1 will feed its signal and the wide variety of cartridges it will support, all with no user adjustments necessary, tying down a set of data for the Phono 1 assumes a great deal. Amplifiers line-level inputs are notorious for their variations in impedance and sensitivity as are cartridges for their output. Thus, the auto-adjustment of the Phono 1 and the caution with which Audiomat supplies data for it. The only drawback to the Phono 1 is the break-in time required. According to Mutine, the North American distributor of Audiomat products, not only does break-in of the Phono 1 take a long time, 200 hours, you also have to do it for each circuit, MM and MC. The unit I tested had already been broken in by the distributor on a wave generator. Even so, I played it for several weeks before I began to take it seriously. All of which means that "trust your ears" continues as a reasonable starting point, one of the reasons behind SoundStage!s emphasis on the "sound" part of reviews. In the course of the Phono 1 review, I changed speakers several times, as I reviewed them. With each set of speakers, the Phono 1 was a standout. When I got down to critical listening, I started by playing a vinyl jazz standard: Miles Davis' Kind of Blue [Columbia, PC 8163]. This is not an audiophile pressing, just your basic $10 record. It also outshines all the CDs to date. Every few years a new digital remaster emerges, and it is deemed better than the remasters before it, but it still comes nowhere near this plain old non-audiophile vinyl. The truth of this statement becomes even more evident when you listen to this record with the Phono 1. My first response was characteristically restrained -- as in, "Wow! Youre kidding?! This is vinyl?" The sheer presence of Davis horn, the overall musicality of the record, the perfect delineation of each instrument and its timbre are stunningly present. I then played another jazz classic, Soultrane from John Coltrane [Prestige OJC-021 (P-7142)]. With this record, I was convinced: the Audiomat Phono 1 is a time machine. Coltranes horn had an immediate woody, mellow sound on "Good Bait," and throughout the album, Red Garlands piano, Paul Chambers bass, and Arthur Taylors drums sounded more immediate -- as they never have before. A short digression. When I had come to the end of a course in Anglo-Saxon language and literature some years ago, the professor spoke to our last class about beauty and where to find it. Since we had just discovered the beauty of Anglo-Saxon poetry, it seemed a natural enough farewell for our class. Then he produced a dandelion gone to seed captured in a block of Lucite. After discoursing briefly on beauty in the weed seed, he played a record: Don Ellis Orchestra - Live at Monterey [Pacific Jazz, ST-20112]. Revelation is not too strong a word to use. The time machine worked again. The Audiomat Phono 1 gave me a similar kind of experience, just better. I dug out the record for this review (I had rushed out to buy it after class that day years ago), and I had a revelation all over again. I've played this record with other phono setups, but this time it gave me shivers and made the hair stand up on the back of my neck. When I heard the three bowed bass viols introduce the theme of "33 222 1 222," I knew my emotions were in trouble. Then the Phono 1 showed me what I had never heard in Ira Schulmans tenor solo in the 34 years since he recorded it. Elliss trumpet solos on this piece and the others on this record? Clear, open, musical -- brass and wind and silk and bite. The detail, which suddenly emerged from this record under the handling of the Phono 1, was extraordinary. A change of pace was in order: Franz Schuberts music for Rosamunde [EMI Records, ASD 3498]. This 1978 record, with Willi Boskovsky conducting the Dresden Staatskapelle and the Leipzig Radio Chorus, features that fine soprano, Ileana Cotrubas, singing "Der Vollmand strahlt." With the Phono 1, her voice was full and moving, giving full weight to this simple song. In another attempt to stretch the Phono 1's capabilities, I played "In der Tiefe wohnt das Licht." The Phono 1 maintained the individuation of voices and horns while blending them into a satisfying wholeness of feeling and sound. The air and space around the voices and instruments made this chorus a remarkable experience. I then left the complexities and textures of chorus and orchestra to listen to free-jazz piano master Paul Bleys album Open, to Love [ ECM 1023 ST]. The opening notes of "Closer," by Carla Bley, impressed me with their clear, defined attack. When the notes are held, the piano rings, as it should, and you can hear every detail of it. I could go through my entire record collection to explain just how the Phono 1 brought my vinyl to life in a way I had not anticipated. So let me stop at this point with Buena Vista Social Club. [Nonesuch/Classic Records RTH 79478] The Phono 1 makes this excellent recording a breathtaking experience. The depth of the voices on "Chan Chan" and Compay Segundos opening bars on guitar for "De Camino a la Vereda" are gripping for their fidelity. Ibrahim Ferrer is much smoother-sounding, demonstrating the beauty of his clearly enunciated singing. Then the percussion, an audiophiles delight. Words fail me other than to say that you can hear wood and leather. Rubén González on piano is so there. His presence is much greater through the Phono 1 than in the 5.1 digital surround DVD format to which I compared it -- a no-brainer, I guess. And this statement brings me to my final point about this phono stages abilities: on every record, it provided a wide and deep soundstage. If the record had it, then the Phono 1 reproduced it. No question, ever. At first while listening to the Phono 1, I thought my recent use of an NAD PP-1 phono stage had colored my thinking about the Phono 1. The PP-1 is a good unit for the money, but I suspected that perhaps my enjoyment of the Phono 1 could only be in that it costs about ten times as much as the NAD phono stage. To check out my impressions, I prevailed on a friend who owns the Blue Circle BC23 phono stage. SoundStage! reviewed this phono amp in 1999 and awarded it a Reviewers' Choice designation. At the time, and at $1250, the BC23 richly deserved the recognition. I also knew of other Blue Circle products and respected their hand-built assembly and generally recognized sound quality. On my first listening, both the Phono 1 and BC23 sounded very good. Then, as I listened to more records, the differences began to stand out. The Phono 1 presented more detail, while also being more musical. By comparison, the BC23 had a weightier, fuller sound. It was still very good, but it just did not have the airiness and analytical qualities of the Phono 1. It did not possess the breadth of soundstage of the Phono 1 or its bass drive either. Full orchestra, for instance, was open and possessing of greater instrumental resolution with the Phono 1. Possibly, if you had an excessively analytical phono cartridge, amplifier, and speakers, the BC23 would tone it all down and make the sound more musical. But the Audiomat Phono 1 is very musical too. Somehow, the French designers and technicians have succeeded in creating a phono amp that does not sacrifice musicality or resolution. The Audiomat Phono 1 is an ear-opener and a soul-stirrer. With the right mood and music, you might even say that it is a heart-warmer. At $990, it is not dirt cheap. On the other hand, at $990, it is stunningly inexpensive for what it will do for your vinyl collection. When I listen to music, I like to hear all of it. The Audiomat Phono 1 gave me every little bit I hoped for. Whether you are just getting back into vinyl or you have never lost the faith, you will enjoy the Phono 1. It does not require fiddling with DIP switches, it takes up little space, it provides a superb musical experience, and it allows you to hear all the wonderful ambience you listen to vinyl for. These handmade jewels of audio wealth come out of the factory slowly and carefully, so dont waste too much time making up your mind. After all, you have all that music you did not know about lurking in your vinyl collection, so you need to start listening -- and soon.